Along a cross country ski trail, sharp elevation changes, narrow fairways, and fantastic mountain views. Hiking boots recommended. Nice facilities at the Lodge. 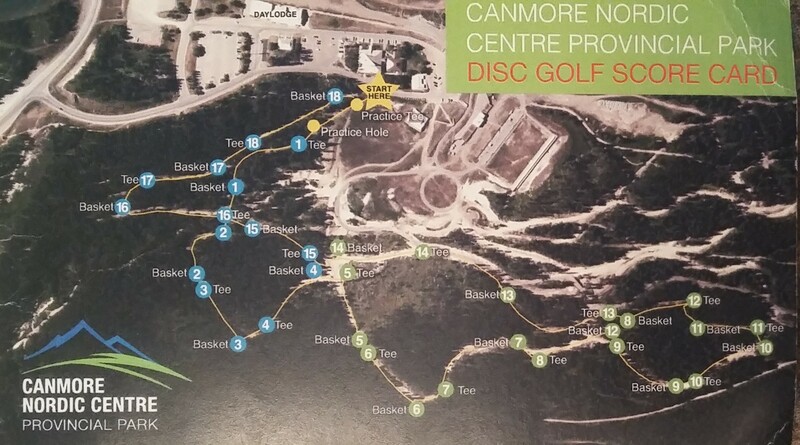 In the winter - there is restricted disc golf access (if any) - contact Alan or the Centre for details. Follow Nordic Centre signs from Canmore, go past flags and park in far parking lot, go under bridge to 1st tee, course on 5 km X country ski loop. Quite challenging course with narrow fairways and high trees around. Great views - one of the most beautiful courses in the world! Baskets a bit old. Helpful staff at Nordic Centre info desk.